Simsbury Roofing Contractor | Brian O'Donnell Quality Home Improvements, Inc.
About Your Roofing Contractor, Brian O'Donnell Quality Home Improvements, Inc.
Brian O'Donnell Quality Home Improvements first began back in 1978 when company owner and founder, Brian O'Donnell, wanted to find a way to provide Simsbury with quality roofing services. Raised his entire life in Simsbury, CT, he has built lasting relationships with friends, neighbors and the community. Widely recognized for his honesty, knowledge and willingness to provide high quality solutions, local homeowners don't need to know any other name when they need a roofing contractor. Brian has also given back to his hometown through countless hours volunteering as a Scout Master with the local Boy Scouts, coaching hockey and attending countless sporting events and activities with his three children. Brian during the 20 years he volunteered as the site and facilities coordinator for Septemberfest. 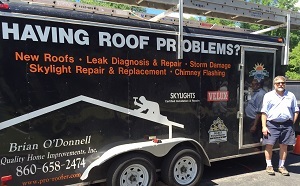 After starting his own roofing company in 1978, he has delighted in being known as "Simsbury’s Professional Roofer" and providing quality work at a fair price. Brian feels there is no substitute for quality work and craftsmanship when you are serving your family, friends and neighbors in your own local communities. You don't have to worry about getting some high-pressure sales pitch from our roofing contractors in Simsbury, CT; our focus is just on providing you with what you want and need. This includes making it a point to use exceptional products, such as CertainTeed brand shingles and Velux "No Leak Skylights." This means you get quality materials that are meant to withstand the weather and the elements even in our region of the country. If you need a roofing contractor in the Farmington Valley area, please give us a call, and experience our first-class service today. 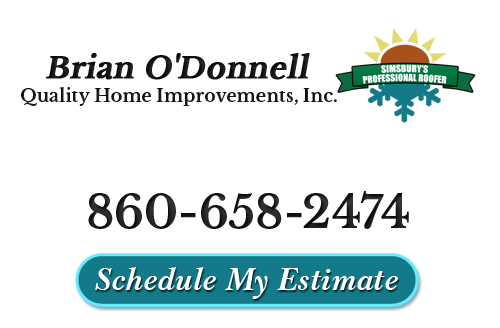 If you would like to know more about our roofing contractors, please call 860-658-2474 or complete our online request form.